Former Chancellor of the Judiciary, Justice Carl Singh Monday night distanced himself from a pronouncement by Attorney General and Minister of Legal Affairs, Basil Williams that he helped block Guyana’s planned establishment of a local law school. “I was never part of any Review Committee discussion on a proposed Law School for Guyana nor have I ever contributed in any form or manner to the preparation and release of any report by the Review Committee which addressed the proposed Law School for Guyana,” said Singh in a statement. Singh acknowledged being a member of the Caribbean Council of Legal Education’s (CLE) Review Committe, but said in the run-up to his retirement in February, 2017 he had not attended meetings personally or electronically. The former substantive Chief Justice accused Williams of being reckless and peddling false information. “This assertion has no basis in truth or in fact. Indeed such a statement was recklessly made without consideration for its consequences. The fact is that for several months prior to my retirement in February of this year, I had stopped attending meetings of the Review Committee. Additionally, my retirement marked the end of my membership of the Review committee,” he said. The CLE Review Committee, according to the Attorney General and Minister of Legal Affairs, has decided that no more law schools would be opened in any of the CLE Treaty signatory nations of the Caribbean. The existing ones are the Hugh Wooding, Norman Manley and Eugene Dupuch Law Schools in Trinidad, Jamaica and The Bahamas respectively. Justice Singh slammed the Attorney General’s statement as containing “troubling parts” in reference to him. The former CLE Review Committee member recalled that all of the meetings of the Review Committee that he had attended were chaired by Mrs. Jacqueline Samuels-Browne, QC. He said he never attended or participated in such meetings chaired by Mr. Reginald Armour, SC the current Chairman of the Council of Legal Education either in person or by electronic means. He added that he certainly did not attend or participate in a Review Committee meeting Chaired by Mr. Armour in January of this year in Jamaica . 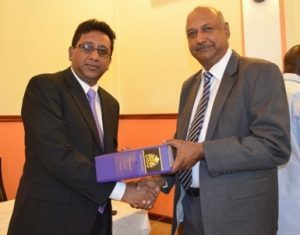 Former Attorney General and Minister of Legal Affairs, Anil Nandlall at the weekend accused Williams of lying when he had said that the CLE had given the green light for Guyana to establish the Joseph Haynes Law School. Williams has since said the CLE has not given into Guyana’s request for the criteria to establish a law school in Guyana. The Attorney General has already entered into a Memorandum CLE has determined that Guyana would conduct its feasibility study but incorporate the requirements of the CLE that a law school under its auspices must satisfy. He said Guyana and its joint venture partners-University College of the Caribbean (UCC) and the Law College of the Americas (LCA) -continue to pursue the feasibility study in keeping with a memorandum of understanding that was inked on January 11, 2017.